" Each year, DOD spends billions of dollars to acquire space-based capabilities that support military and other government operations. The majority of DOD's space programs were beset by significant cost and schedule growth problems during their development. Most programs are now in production, however, and acquisition problems are not as widespread and significant as they were several years ago. In prior years, GAO has identified a number of actions DOD is taking to improve management and oversight of space program acquisitions. Facing constrained budgets and concerns about the resiliency of its satellites, DOD is considering potential changes to how it acquires space systems. 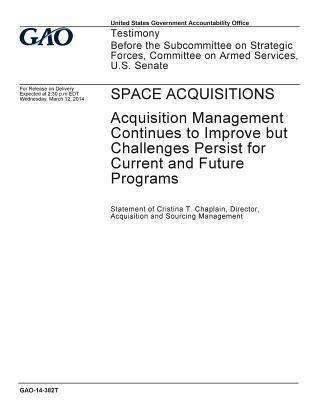 This testimony focuses on (1) the current status and cost of major DOD space systems acquisitions, (2) recent actions taken to further improve space systems acquisitions, and (3) potential impacts of the direction DOD is taking on upcoming changes to the acquisition of DOD space systems. This testimony is based on previously issued GAO products, ongoing GAO work on disaggregated architectures, interviews with DOD officials, and an analysis of DOD funding estimates from fiscal years 2013 through 2018. "